Diagnose Your Car like a pro. Reset check engine warning and instantly transform your car into a Smart Car. This OBD2 Scanner can read generic and manufacturer-specific trouble codes and its database includes over 3000 code definitions. We would like to provide best service to all our customers. Please send us email on Amazon if you have problem or question, we will provide one year warranty to you. 1. Our obd2 scanner support all 12 V Gasoline car, don't support diesel car, 24V heavy duty cart, Hybrid or electric vehicles. If your car is a 12 V Gasoline car, and it supports OBD-II protocols, you can use the car obd 2. If you are not sure, you can check the front cover of your car and the manual. 2. Please turn on your car when connecting, otherwise, the App will not connect successfully. Or you could search these APP on Apple store or Google play. OBD Auto Doctor, OBD Car Doctor, Car Scanner OBD Fusion, DashCommand etc. Torque Pro, Dash Command, OBD Auto Doctor, OBD Car Doctor, DashCommand etc. Professional Scanner: Smart Wireless OBD2 Scanner, read all diagnostic trouble codes for your car, both generic and manufacturer-specific, and its database includes over 3000 code definitions. Show the meaning of the codes to your. Help you find the problem of your car and repair the simple problem by yourself but not the hundreds of dollars on garage. Great Compatibility: This smart OBD2 Reader works on ALL 1996 and newer petrol vehicles, light trucks purchased in USA, including vehicles made in America, Europe and Asia. But NOT compatible with diesel, hybrid & trucks. Support OBD-II protocols including ISO15765-4 (CAN), ISO14230-4 (KWP2000), ISO9141-2, J1850 VPW, J1850 PWM. Real-Time Sensor Data Reader: After you have installed this OBD2 Scanner and have started the vehicle, you can get the REAL-TIME sensor data of your car, including Engine RPM, Calculated Load Value, Coolant Temperature, Fuel System Status, Vehicle Speed, Short Term Fuel Trim, Long Term Fuel Trim, Intake Manifold Pressure, Timing advance, Intake Air Temperature,Air Flow Rate, Absolute Throttle Position, Oxygen sensor voltages/associated short term fuel trims, Fuel System status, Fuel Pressure. 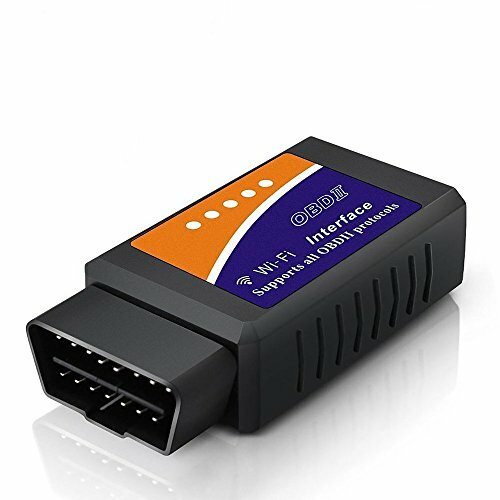 Easy to USE: This OBD2 Scanner connects with Android/IOS device by Wireless network. Easy to install and use, just download the FREE APP and plug the device in your car's OBD2 port, start the engine and enable Wireless on your Android phone or tablet, search for "OBDII" and pair with it, run the downloaded App and wait until it connects your car's ECU successfully. More install details and Recommend APP you can see on instruction included in the box. Warranty Guarantee: 1 year warranty, 30 days free replacement or return, friendly customer support. Your satisfaction is the best gift for us. Package include: 1*OBD2 Car Scanner; 1* Instruction. If you have any questions about this product by DOSNTO, contact us by completing and submitting the form below. If you are looking for a specif part number, please include it with your message.